A guide to progression, keying, flagging, and access within the Omens of War expansion. 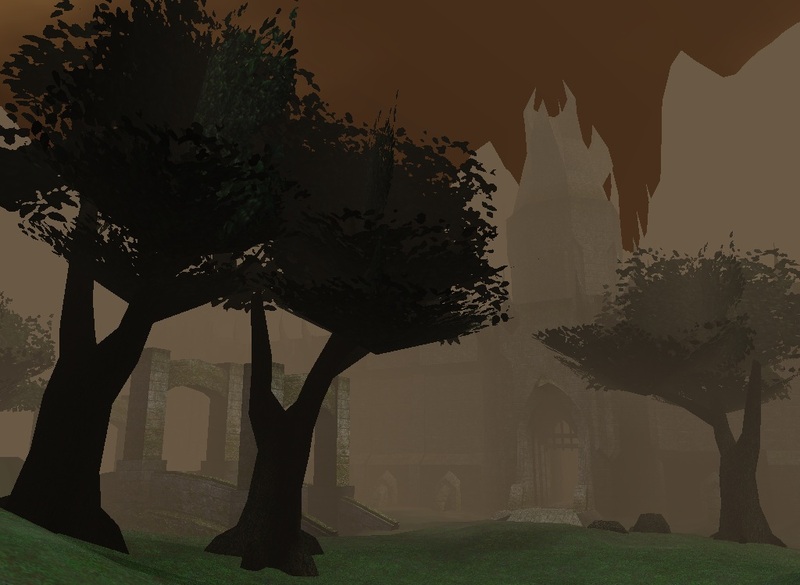 Omens of War was announced on May 6, 2004, and went live on September 14, 2004. The initial expansion announcement may be found here. The initial patch message may be found here. The Wayfarers Brotherhood, in an effort to put an end to the tyranny of the muramites, worked with the Priests of Discord to open a portal into the realm of Discord. Although puzzled by the realm of chaos and unsure if the risks were worth it, the Wayfarers Brotherhood moved forward with their expedition into Kuua. Unlike the nihilites of Taelosia, the brotherhood was prepared for what lied ahead. 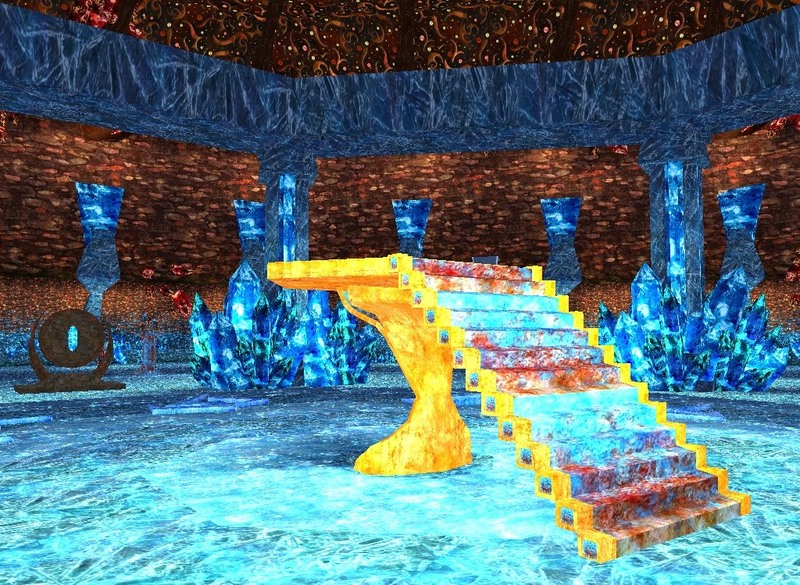 Kuua was once quite similar to Norrath. It is the home of the Dragorn. Carved from the heartiest of earth and stone by the great dragon, Dranik, the peaceful existence of these noble beings was shattered by the influence of Discord as shades of darkness grew over the continent, opening the door for the invading legion of Mata Muram. Upon this dark taint on Kuua, all races began fighting one another -- wars which were responsible for the ashen sky which still, to this day, looms over the continent. By this point, the dragorn stopped their travels and fortified themselves within the walls of Dranik, fighting off all outsiders. There is a number of Dragorn who were exiled from Dranik before and after the influence of Discord caused fighting among the race. 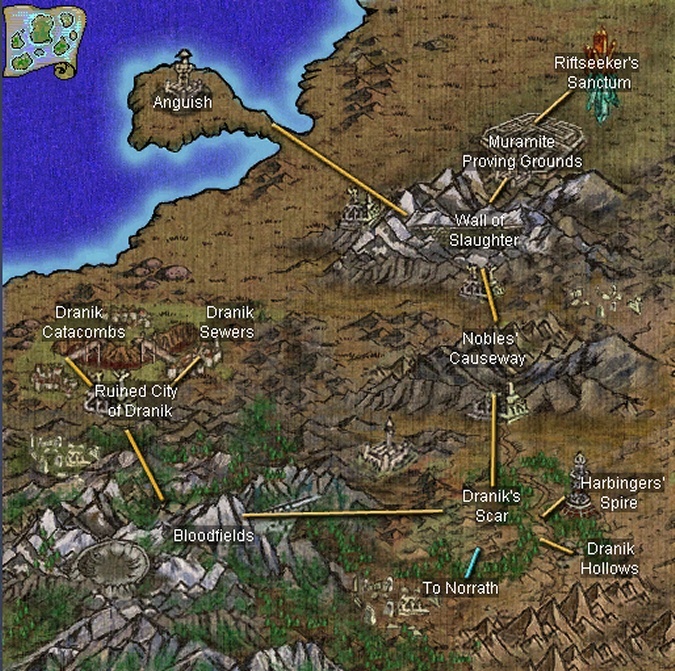 The exiles are often on the outskirts of the city in the caves of Dranik's Scar or other outlying areas. They have attempted to organize and overthrow the High Council several times with no success. Some of them feel they were wrongly accused and wish to return home. Some dragorn, most of the best fighters in the lands, were blackmailed or brainwashed into joining Mata Muram's legion. How did this come about? Mata Muram made use of Bealu's planar creation, the Riftseekers, which were granted to him for travel between worlds and to seed Discord into as many realms as possible. Mata Muram is a slave trader who conquers large numbers of races, inducting the best fighters into his own legion and selling the rest to other worlds. He has since taken up residence in Anguish, the Fallen Palace, a massive structure hidden in the mountains of the northeast. A list of Omens of War zones may be found here. The in-game zone-connection map may be found here. Speak with any Priest of Discord and tell him you wish to go to the realm of Discord. You will land in Dranik's Scar. To leave the continent, just tell one of the priests in Dranik's Scar that you wish to return. Wizards and Druids are able to port to the Bloodfields and to the Wall of Slaughter. The Wall of Slaughter is also a destination in the guild hall portal. You will probably want to pick up your new spells as you level up. Karsor the Mad in Dranik's Scar tells you about some runes you should be the lookout for. Druids and Wizards can obtain their Bloodfields port spells via this quest offered by the Priest of Discord (any Priest except for those in Dranik's Scar). Druids and Wizards can obtain their Wall of Slaughter port spells via this quest from the Elder Priest of Discord in Dranik's Scar. 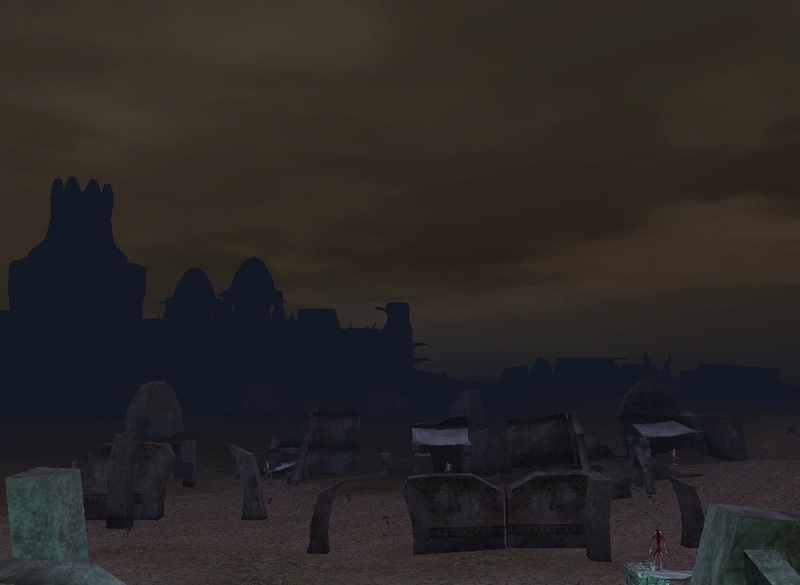 The Asylum of Anguish is the only keyed zone in the Omens of War. Collecting seven signets from various parts of the continent off one-groupable NPCs. Mastery of Adaptation offered by the Projection of Realms. Mastery of Corruption offered by the Projection of Power. Mastery of Endurance offered by the Projection of Body. Mastery of Foresight offered by the Projection of Tactics. Mastery of Hate offered by the Projection of Mind. Mastery of Specialization offered by the Projection of Arcana. The signets are a must in order to enter Anguish. The raid trials may be bypassed if at least 85% of your raid is already flagged. However, you will not be able to loot items in Anguish until you have a "Seal: Mastery of All" in your possession. This is obtained by completing the six MPG raid trials OR looting one off a raid encounter NPC in Anguish. Mastery of Destruction offered by the Projection of Power. Mastery of Efficiency offered by the Projection of Arcana. Mastery of Fear offered by the Projection of Mind. Mastery of Ingenuity offered by the Projection of Realms. Mastery of Subversion offered by the Projection of Tactics. Mastery of Weaponry offered by the Projection of Body. With Omens of War come updated epics. If you have you have your epic 1.0, you can move on to your epic 1.5 quest, and then your epic 2.0 quest. If you are without your epic 1.0, you will have to go through some tasks in order to open up your 1.5 quest. Bards' epic 1.5 quest results in Prismatic Dragon Blade. Beastlords' epic 1.5 quest results in Savage Lord's Totem. Berserkers' epic 1.5 quest results in Raging Taelosian Alloy Axe. Clerics' epic 1.5 quest results in Harmony of the Soul. Druids' epic 1.5 quest results in Staff of Living Brambles. Enchanters' epic 1.5 quest results in Oculus of Persuasion. Magicians' epic 1.5 quest results in Staff of Elemental Essence. Monks' epic 1.5 quest results in Fistwraps of Celestial Discipline. Necromancers' epic 1.5 quest results in Soulwhisper. Paladins' epic 1.5 quest results in Redemption. Rangers' epic 1.5 quest results in Heartwood Blade. Rogues' epic 1.5 quest results in Fatestealer. Shadowknights' epic 1.5 quest results in Innoruuk's Voice. Shamans' epic 1.5 quest results in Crafted Talisman of Fates. Warriors' epic 1.5 quest results in Champion's Sword of Eternal Power. Wizards' epic 1.5 quest results in Staff of Prismatic Power. Bards' epic 2.0 quest results in Blade of Vesagran. Beastlords' epic 2.0 quest results in Spiritcaller Totem of the Feral. Berserkers' epic 2.0 quest results in Vengeful Taelosian Blood Axe. Clerics' epic 2.0 quest results in Aegis of Superior Divinity. Druids' epic 2.0 quest results in Staff of Everliving Brambles. Enchanters' epic 2.0 quest results in Staff of Eternal Eloquence. Magicians' epic 2.0 quest results in Focus of Primal Elements. Monks' epic 2.0 quest results in Transcended Fistwraps of Immortality. Necromancers' epic 2.0 quest results in Deathwhisper. Paladins' epic 2.0 quest results in Nightbane, Sword of the Valiant. Rangers' epic 2.0 quest results in Aurora, the Heartwood Blade. Rogues' epic 2.0 quest results in Nightshade, Blade of Entropy. Shadowknights' epic 2.0 quest results in Innoruuk's Dark Blessing. Shamans' epic 2.0 quest results in Blessed Spiritstaff of the Heyokah. Warriors' epic 2.0 quest results in Kreljnok's Sword of Eternal Power. Wizards' epic 2.0 quest results in Staff of Phenomenal Power. Dranik Loyalist faction figures into many quests within this expansion. You start off scowling with them. Check out the faction listing here for what quests to do and what NPCs to kill in order to raise your faction. Also on that page is a list of quests involving Dranik Loyalists (many with pretty decent rewards). Bards receive Traveler's Mail Armor. Beastlords receive Beast Tamer's Armor. Berserkers receive Ragebound Chain Armor. Bards receive Farseeker's Plate Armor of Harmony. Beastlords receive Savagesoul Armor of the Wilds. Berserkers receive Wrathbringer's Chain Armor of the Vindicator. Clerics receive Faithbringer's Armor of Conviction. Druids receive Everspring Armor of the Tangled Briars. Enchanters receive Mindreaver's Armor of Coercion. Magicians receive Glyphwielder's Armor of the Summoner. Monks receive Fiercehand Armor of the Focused. Necromancers receive Blightbringer's Armor of the Grave. Paladins receive Dawnseeker's Armor of the Defender. Rangers receive Bladewhisper Chain Armor of Journeys. Rogues receive Whispering Armor of Shadows. Shadowknights receive Duskbringer's Plate Armor of the Hateful. Shamans receive Ritualchanter's Armor of the Ancestors. Warriors receive Gladiator's Plate Armor of War. Wizards receive Academic's Armor of the Arcanists. This page last modified 2017-01-08 17:03:52.